1967 Zippo 14K Gold Lighter original vintage advertisement. 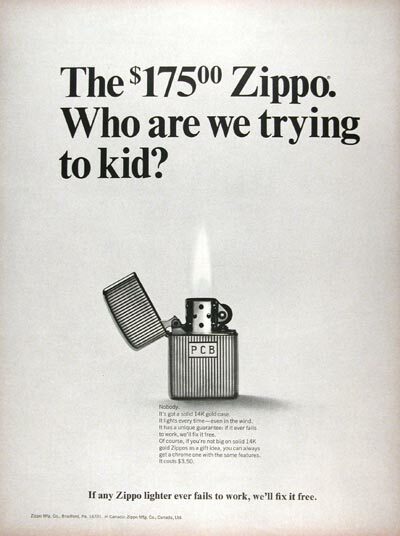 The $175.00 Zippo. Who are we trying to kid? Nobody. It's got a solid 14K gold case. It lights every time - even in the wind. It has a unique guarantee: if it ever fails to work, we'll fix it free. Of course, if you're not big on solid 14K gold Zippos as a gift idea, you can always get a chrome one with the same features. It costs $3.50.